Preservation New Jersey's 2017 10 Most Endangered Historic Places List Announced ~ The History Girl! In recognition of National Preservation Month, Preservation New Jersey, Inc. (PNJ) announced its annual list of the 10 Most Endangered Historic Places in New Jersey on the front steps of the State House in Trenton, New Jersey at 10:00 am on Thursday, May 18, 2017. PNJ was joined by the advocates for this year’s endangered historic places at a rally to support New Jersey’s threatened cultural and architectural heritage. The 10 Most Endangered Historic Places program spotlights irreplaceable historic, architectural, cultural, and archaeological resources in New Jersey that are in imminent danger of being lost. The act of listing these resources acknowledges their importance to the heritage of New Jersey, and draws attention to the predicaments that endanger their survival and the survival of historic resources statewide. The list, generated from nominations by the public, aims to attract new perspectives and ideas to sites in desperate need of creative solutions. Several challenges face properties on this year’s endangered sites list, including the difficulties of raising adequate historic preservation funding, neglect and deferred maintenance, threats incurred by redevelopment and new construction, the need for creative adaptive reuse proposals, and the lack of state entities recognizing and preserving historic resources. As the economy continues to improve, the impacts to historic properties and places are more imminent. The list demonstrates increased development pressures resulting in threats of demolition of the historic resource; the need to incorporate history and historic preservation in redevelopment plans for neighborhoods, towns, and cities throughout the state; and the value of using preservation as a positive tool for revitalization. As we acknowledge each year, selections to the 10 Most Endangered Historic Places list are based on the likelihood that historic buildings and places can be brought back to useful and productive life. PNJ proudly points to many properties previously listed among the 10 Most Endangered that have now been saved and preserved or rehabilitated, and have once again become character-defining assets to New Jersey’s communities. As we announce this year’s list, we are encouraged by recent news regarding the Union Hotel in Flemington, which was included on our 2016 list. The Flemington Redevelopment Committee and the developer have reached a new redevelopment plan that no longer calls for demolition of the Union Hotel and another historic building on Main Street. While the details on the new plan are not clear yet, PNJ believes the Borough and developer’s change of attitude about this significant building is a step in the right direction, and are encouraged local advocates will continue to bring awareness to the value of preserving a historic resource in its entirety to the decision-makers. Although PNJ’s 10-Most Endangered Properties list is published once per year, the fight for the preservation of our historic and cultural resources is daily, and the news of the Union Hotel is evidence that bringing awareness of such threats can bring about creative solutions. This striking 1963 mid-twentieth-century modernist bank in Caldwell’s central business district features three pedestal-like pavilions connected by an undulating thin-shell concrete roof. Currently for sale, its loss of function and valuable location leave it vulnerable to demolition and redevelopment. This architecturally distinguished building in this prominent location can and should become a community asset with the application of creative thinking. Constructed between 1916 and 1918, this Collegiate Gothic high school known locally as “the Castle on the Hill,” may not survive to see its second century. After spending $4 million to restore the 75-foot turreted tower with leaded-glass windows in 2009, the NJ School Development Authority now intends to demolish the building at the end of the current school year. The mayor, school board, state education department, and SDA should recognize the cultural significance of historic school buildings and halt their costly, wasteful, and shortsighted demolition plan. This Romanesque Revival fire station was constructed in 1897 to house the volunteer Excelsior Engine Company No. 2 and later served as the clubhouse for the Association of Exempt Firemen of West New York. The building now sits vacant and deteriorating. With the 120th anniversary of the town approaching, PNJ encourages West New York to embrace this local landmark, an important reminder of the role volunteer fire companies play in communities, and return it to a public use. This factory building composed of two historic farmhouses and prominently situated in the historic district of Crosswicks Village, once housed one of the most successful businesses in the township. Vacant for several years and in severe disrepair, the property is currently listed for sale as a tear down. PNJ calls on the township to work with any interested buyer to preserve as much of the original fabric as possible. Constructed in the early twentieth century on the prominent estate of James Buchanan Duke, this greenhouse complex is believed to be the design of Julian Abele, the first African-American architecture graduate from the University of Pennsylvania, while he worked in the office of Horace Trumbauer. Following last year’s controversial demolition of the Duke mansion by the Duke Farms Foundation, PNJ encourages preservation of the greenhouses and discontinuation of the Foundation’s pattern of demolition by neglect. ***UPDATE*** Preservation New Jersey has received additional information from Duke Farms regarding the preservation and continued use of the Trumbauer/Abele Greenhouse Complex. Duke Farms Executive Director, Michael Catania, explained that while the greenhouses are not open to the general public, “many of these greenhouse have remained in active use – to grow native plants for our extensive on-site ecological restorations, to start seeds for our Sustainable Farming Enterprise Program and for our extensive community garden program, and for storage for equipment and vehicles”. 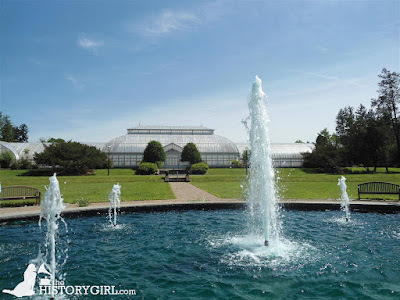 In addition, the Foundation has plans to “to reuse the complex for a wide variety of programmatic purposes, especially the 1917 Conservatory and adjacent greenhouses, which we plan on utilizing for a welcome center and program area for the many large school groups which visit Duke Farms every year”. With regard to plans for the adaptive reuse of the structures, Mr. Catania said, “While we do not have any specific blueprints or floor plans to share just yet, the fact of the matter is that the complex is in fairly good shape for its age, and we hope to wrap up our internal planning and proceed with some renovations of the conservatory within the next year or two. We believe that our proposed adaptive reuse of the greenhouse complex, which has already begun, is much more consistent with our new mission to be a model of environmental stewardship”. Constructed c.1785, this building survives as the oldest in its original location in the Mount Bethel section of Warren. Originally built as a home for one of Warren’s pioneer families, the building had become an inn or tavern by 1804. It changed hands and names many times over the next two centuries, and last housed a restaurant in 2010. Damaged during Hurricane Irene, the current owner claims the building is beyond repair and seeks to redevelop the area. PNJ believes all avenues for the building’s revitalization should be explored before demolition is considered. James Rose, a leader of American landscape modernism, constructed his mid-twentieth-century home with three interlocking shelters built of inexpensive building materials and connected by a structural framework and courtyards that fuse indoor and outdoor space. Significantly damaged by a fallen tree in 2016, which subsequently revealed structural problems throughout the house, expensive repairs are now necessary to make the property safe for its current use as an educational center. With creative planning and fundraising, this unique and beautiful structure can be repaired and adapted to support the center’s programs. This elaborate cast iron fountain was the centerpiece of Founders Park in Ocean Grove when it was placed there in 1907 as a memorial until vandals clogged it in 1977. Today it remains partially intact and in severe disrepair. Many of the original molds are available for the fountain’s restoration, but the expensive cost is beyond the means of the historical society that owns it. The fundraising challenge facing the Ocean Grove Historical Society characterizes the many small historical societies throughout the state that struggle to raise the funds necessary to preserve irreplaceable resources. This pair of pre-cast concrete buildings (one a cylinder and one a cube) connected by steel-and-glass pedestrian bridges were designed by modernist architects Alfred Clauss and Jane West Clauss to house NJ’s Departments of Health and Agriculture. In an attempt to reduce the footprint of state office buildings in downtown Trenton, the current administration and the NJ Economic Development Authority have plans to demolish these buildings. PNJ believes they should instead restore these notable mid-century buildings and modernize the interiors to be used by the public or private sector. The c.1865 Jacob’s Chapel, the early-nineteenth-century Colemantown Meeting House, and a c.1851 cemetery are all that remain of the historically important, nineteenth-century African-American community of Colemantown. The meeting house was already in poor condition when Superstorm Sandy brought devastating flooding, rendering the building unusable. The estimated $1.3 million for repair, restoration, and site improvements are well beyond the means of the congregation. PNJ calls on the state history community to recognize the significance of this site and advocate for its preservation. Founded in 1978, Preservation New Jersey is a nonprofit organization that helps homeowners, organizations, public officials, and citizen advocates working to preserve the historic neighborhoods and sites that are important to our communities. Preservation New Jersey produces this annual list of New Jersey's 10 Most Endangered Historic Places in addition to other advocacy programs; provides educational workshops; publishes an interactive website; serves as a resource for technical assistance and general advice for the public; and addresses legislation and public policies that impact New Jersey's historic places and communities. Visit Preservation New Jersey’s websites at www.preservationnj.org for more information regarding the organization and the 10 Most Endangered program. For details about National Preservation Month, visit the National Trust for Historic Preservation’s website at www.preservationnation.org.